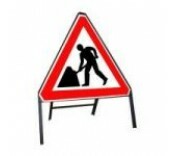 750mm Roadworks Ahead Sign Class I reflective zintec plate riveted into an angle-iron frame. ..
750mm Keep Left Sign Temporary Class I reflective zintec plate riveted into an angle-iron frame..
Class I reflective zintec plate riveted into an angle-iron frame. Fully complies with BS 8442. ..
750mm Road Narrows Nearside Sign Class I reflective zintec plate riveted into an angle-iron fra..
750mm Road Narrows Nearside c/w Single File Traffic Sign Class I reflective zintec plate rivete..
750mm Road Narrows Offside Sign Class I reflective zintec plate riveted into an angle-iron fram..
750mm Road Narrows Offside c/w Single File Traffic Sign Class I reflective zintec plate riveted..
750mm Give Way Sign Class I reflective zintec plate riveted into an angle-iron frame. A tempo..
750mm Traffic Signals Ahead Sign Class I reflective zintec plate riveted into an angle-iron fra..
750mm Two Way Traffic Sign Class I reflective zintec plate riveted into an angle-iron frame. ..
750mm Loose Chippings Sign Class I reflective zintec plate riveted into an angle-iron frame. ..
750mm Uneven Road Ahead Sign Class I reflective zintec plate riveted into an angle-iron frame. ..
750mm Slippery Road Ahead Sign Class I reflective zintec plate riveted into an angle-iron frame..
750mm Other Danger Sign Class I reflective zintec plate riveted into an angle-iron frame. Thi..
750mm Flood Sign Temporary Class I reflective zintec plate riveted into an angle-iron frame. ..
No Entry Sign Temporary Class I reflective zintec plate riveted into an angle-iron frame. Ful..
750mm No Left Turn Sign Class I reflective zintec plate riveted into an angle-iron frame. Ful..
750mm No Right Turn Sign Class I reflective zintec plate riveted into an angle-iron frame. Fu..
750mm Ice Sign Temporary Class I reflective zintec plate riveted into an angle-iron frame. Fu..